The tears came abruptly. We had been discussing the University of Illinois men’s basketball team—whose run to the 2005 national title game she covered for the Chicago Tribune—when the woman across the table from me apologized. Then, she began to cry. “You asked before about immigration … I think my family did experience the ugly side of that. What people don’t realize, it is not always people calling you names. In our case, we were a family of nine. We couldn’t find anyone to rent us a home. And it was brutal,” said Marlen (MARE-a-lin) Garcia ’93. We were having lunch with the business crowd in June on a second-floor restaurant in a Loop hotel, a couple of miles east from where Garcia works as an opinion writer for the Chicago Sun-Times. Garcia had been buoyant up to that point in our interview. Dressed in a light blue sweater and a spring dress, she smiled often as she talked about her newspaper career and life as a child in a Mexican immigrant family. She even joked about her Spanish, which she grew up speaking at home. She mentioned that former Cubs slugger and Dominican Republic native Sammy Sosa once made fun of her for speaking Mexican Spanish with an English accent. For years, the turmoil of Garcia’s past never rose to the surface. She waited more than a decade into their relationship before telling her husband that her family was homeless for a time while she was a teenager. Things had changed, however, and in her view decisively, since President Donald Trump’s electoral victory. Trump’s rhetoric revived something dormant in the American psyche, Garcia thought, recalling an incident in 2016. Her mother, Elena, accidentally spilled a woman’s coffee at a Chicago bus stop. The woman responded by saying she hoped Trump would be elected so he would deport Elena. “It’s not just rhetoric. It’s very dangerous because it gives people license to mistreat people in ways that good-natured Americans would know that is wrong, instinctively and intuitively,” Garcia said. Given this national dynamic, journalism and Garcia’s background growing up in an immigrant family have tied back together. The two threads were separate for most of her adult life. 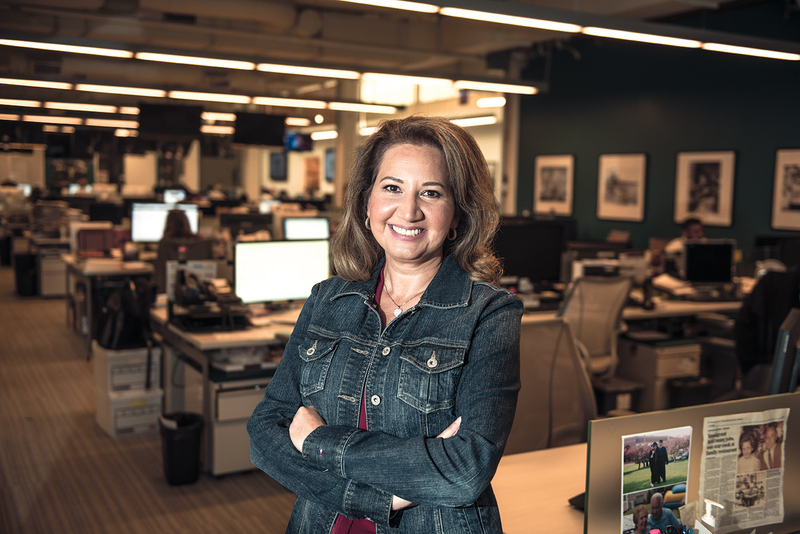 Garcia spent the first 15-plus years of her newspaper career writing about sports. 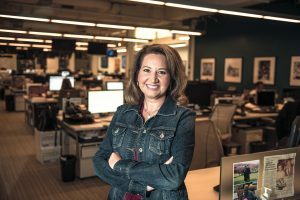 She started at the Chicago Tribune as an editing assistant and rose to reporter before becoming the lead college basketball writer at the USA Today for five years. She took a buyout in 2012 and decided to try something radically different just as the immigration debate was heating up over Obama’s new policy to grant relief from deportation for children brought to the country illegally. Jim Kirk ’90, a former Tribune colleague and fellow Illinois State alum, recruited Garcia to be a columnist at the Chicago Sun-Times, where he was then the editor-in-chief. Three years later, she joined the Sun-Times’ editorial board. Marlen Garcia has become a voice for immigrants and underdogs since joining the Chicago Sun-Times newsroom. Instead of tracking box scores and the latest sports news, Garcia has been keeping tabs on politicians and has emerged as a voice for the city’s working class. Garcia’s columns include a heavy dose of reporting with a focus on the stories of the immigrants and blue-collar workers whose lives are shaped by laws enacted far from their neighborhoods. For example, she wrote in support of a city ordinance that would require all companies to offer sick days—a benefit her mother was deprived of for almost the entire 40 years she worked at her factory job. In another column, Garcia advocated for the Illinois Monetary Award Program, whose grants enabled her to afford college. She told the story of a senior at the Illinois Institute of Technology who was forced to work two jobs and launch a GoFundMe drive due to a lack of assistance. Garcia writes about her late father, Pedro. He was born a U.S. citizen in southern Texas. His parents brought him as a young boy to northern Mexico during the Great Depression. With not enough documentation to prove his citizenship, he spent the 1950s crossing the border illegally to work as a migrant farmer in the United States, harvesting tomatoes in Ohio, potatoes in Idaho, and cotton in Texas. She used his life story to write about migrant labor rights. One farmer told Pedro and his fellow migrants he could not afford to pay them, so he gave them “rare” coins. Marlen later discovered they were worthless. After a long process, Pedro finally persuaded U.S. immigration officials that he was a citizen. 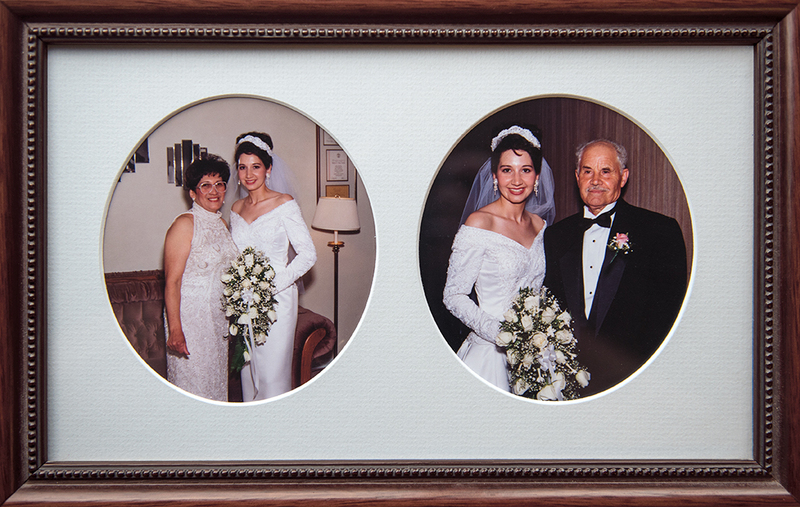 In 1967 he immigrated, legally, to Chicago with his Mexican wife and Marlen’s older siblings. 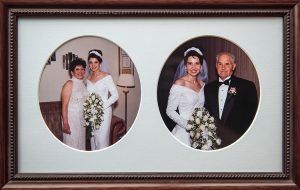 Marlen was born in the United States and grew up in minority neighborhoods in Chicago’s suburbs, moving frequently as her family struggled to gain a foothold in the United States. Her dad eventually was hired as a unionized janitor at O’Hare Airport. Her mother found that factory job where she would work until she was forced to quit at the age of 79. “My passion about immigration has a lot to do with my upbringing, and what I’ve learned since,” Garcia said. Stories about Garcia’s parents, Elena and Pedro, add poignancy to her columns about current issues. Garcia’s family bounced from one rented place to the next. She and her siblings had to lie about how many children actually lived at home so they wouldn’t get evicted. Her family lost their home when Garcia was 13, forcing her and her siblings to split up for the summer and live with friends and relatives. Her parents took shelter at a ramshackle motel. Garcia wrote for the student newspaper at Maine West High School, and covered high school sports as a stringer for the now defunct Des Plaines Times. She wasn’t sure what she would study once she arrived at Illinois State as a Robert Bone Scholar and a walk-on for the Redbird cross-country team. During her sophomore year, she received an internship through the University’s Minority Professional Opportunities Program under then sports information director Tom Lamonica, M.S. ’88. She credits Lamonica for reigniting her interest in journalism. As a student, Garcia worked at TV-10 and WZND, was a correspondent for The Vidette, and wrote features for Athletics game-day programs. She also interned at the Telemundo affiliate in Chicago. 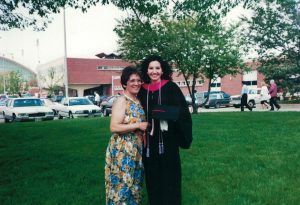 Marlen Garcia, with her mother on graduation day in 1993, credits her experiences at Illinois State with helping her launch a successful journalism career. Garcia’s life has come full circle now. She is writing about and for the people with whom she grew up, those immigrant families who are fighting to escape poverty and find the American dream—just like her family. Congrats to Marlen and others whose families have struggled here. We must finally face the fact that immigrants and minorities are increasingly a major force in America. They and the children they bear account for 60 percent of our nation’s population growth, own 11 percent of US businesses, and are 60 percent more likely to start a new business than native-born Americans. In fact, forty percent of Fortune 500 companies were started by an immigrant or a child of an immigrant, creating 10 million jobs and seven out of ten top brands in our country. More importantly, the vast majority of these human beings—both legal and undocumented—come to improve their lives and create a foundation of success for their children to build upon, bringing skills and a willingness to work hard to make their dreams a reality, something our founders did four hundred years ago, and something we would do today if we were in their shoes. However, most struggle in their efforts and need guidance in Anytown, USA. Perhaps intelligent immigration reform, White House/Congress and business/labor cooperation, concerned citizens and even informative books can extend a helping hand, the same unwavering hand, lest we forget, that has been the anchor and lighthouse of American values for four hundred years.